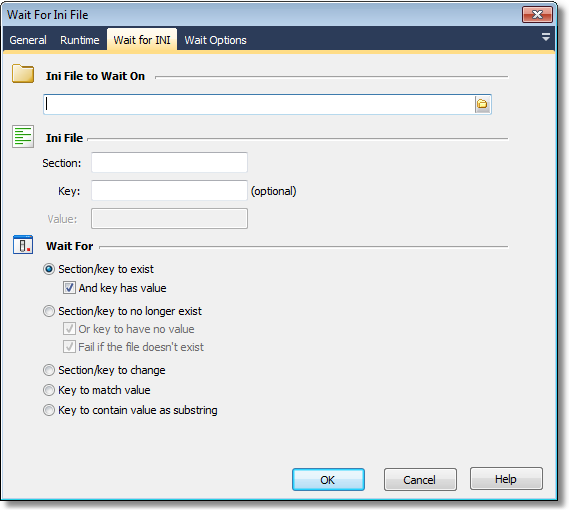 The Wait For Ini File action allows you to wait until a section or entry in an Ini File matches a specific condition. For an overview of "Wait For..." events, including specifics of the Wait Options, see this topic. Specify the name of the Ini file to monitor for changes. Specify the section and (optionally) the key name to monitor for changes. If you are waiting for a certain value (or substring), specify it here too. Use this option to wait for either a section or a key (under a section) to appear in the Ini file. If you specify a key name, you can also check whether or not they key needs to take a value. Otherwise, 'KeyName=' will be considered as an existing key. "Section/key to no longer exist"
Use this option to wait until a section or key no longer exists. If you specify a key name, check the "Or key to have no value" box if you want a blank value (ie 'KeyName=') to be a sufficient condition for continuing. Use this option to wait until a section or a key changes. If you specify a key, then the action will continue when the key is erased, created, or its value is changed. If you only specify a section, the action will continue when a key is added or removed from the section, or when the value of any key in the section changes. You need to specify a key name for this option. The action will continue when the value for the key perfectly matches the specified value. "Key to contain value as substring"
You need to specify a key name and a value to wait for. The action will continue when the value for the key contains the substring you specify in the "Value" field.